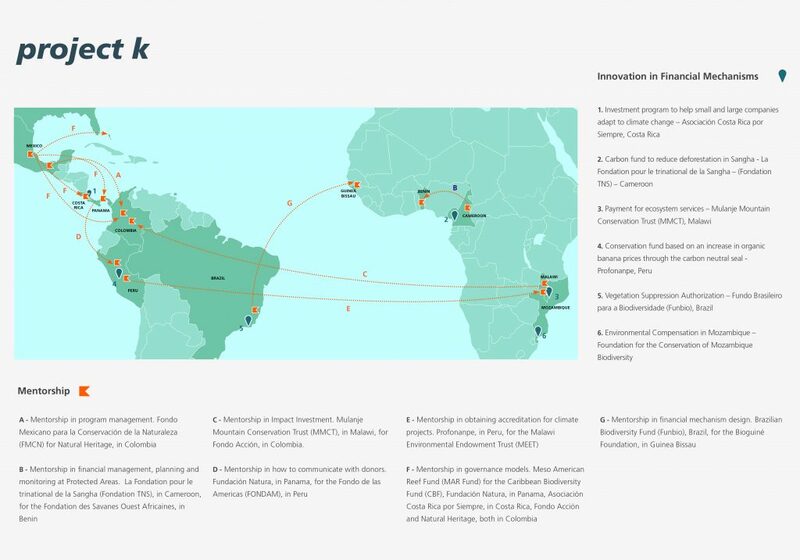 Knowledge for Action – Project K is a joint initiative by the Latin-American and Caribbean Network of Environmental Funds (RedLAC) and the Consortium of African Funds for the Environment (CAFE). Together, these networks represent 40 environmental funds from 28 countries. The members are the financial managers of some of the most important conservation projects on these continents. Funbio’s role is to manage the project, which is divided into four components: (1) innovation in financial mechanisms; (2) training; (3) web platform; and (4) network strengthening. Project K is financed by the French Fund for the Global Environment (FFEM), MAVA and the GEF through the UNEP. Funbio manages the project’s financial resources and activities. “Innovation in financial mechanisms” fosters studies and designs new ways to raise resources for conservation. During the first stage, in March 2016, the funds presented concepts, ten of which were chosen by an external technical committee to receive US 20 thousand in project-viability funding. At stage two, the studies were analyzed and the top six projects received funding of up to USD 200 thousand. The beneficiaries will have to foot an equal counterpart to the sum granted and will have until the end of 2018 to submit the design of their mechanisms. “Capacitation” combined seven workshop and mentoring initiatives, through which funds from the networks support each other on specific demands. The RedLAC working group is also part of this drive, discussing how the funds can best assess their impact on conservation. “Web platform” involves the creation of distance-learning tools and forums for the exchange of experiences and materials. It also feeds the program’s database. Component Four will support the strategic planning, structuring and consolidation of the two networks, as well as sporadic support through working groups, such as the one created to discuss the networks’ financial sustainability.